• Or use the keyboard shortcut, Ctrl+G. 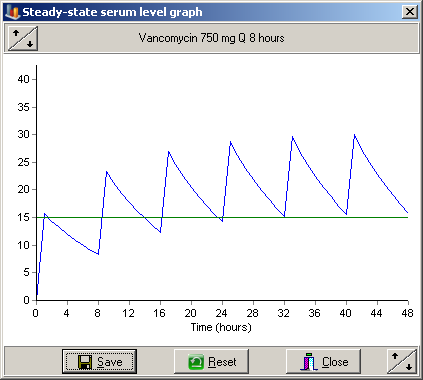 Please note: until a dose and interval has been correctly entered, the View Graph option is disabled. Click Save to have the graph printed on the consult form. Click Reset to reset the graph X,Y scaling to default values. Click the button in the upper left corner to increase or decrease the scale of the Y axis. Click the button in the lower right corner to increase or decrease the scale of the X axis. Click to close the graph window without saving.